After weather scrubbed a pre-holiday powered flight attempt last month, SpaceShipTwo took to the skies yesterday, performing its third powered flight. After being released from its WhiteKnightTwo carrier aircraft shortly after 8 am PST (11 am EST, 1600 GMT) Friday at an altitude of 14,000 meters (46,000 feet), SpaceShipTwo fired its hybrid rocket engine for 20 seconds, achieving a top speed of Mach 1.4 and peak altitude of 21,600 meters (71,000 feet) before gliding to a runway landing at the Mojave Air and Space Port in California, the company reported in a statement. The performance of the flight was not much different from the vehicle’s previous two powered flights. In September, SpaceShipTwo fired its engine for 20 seconds as well, flying a little faster (Mach 1.43) but a little lower (21,000 meters) than Friday’s flight. On its inaugural powered flight in late April 2013, SpaceShipTwo fired its engine for 16 seconds, going only a little slower and lower than the following two flights. Virgin billed this flight, though, as more of a flight demonstration and training mission. Virgin said that during the flight they tested the vehicle’s reaction control system (RCS), thrusters that maneuver the vehicle when above the atmosphere. The flight also tested reflective material placed on the inboard surfaces of the vehicle’s twin tail booms, which is intended to reduce temperatures on those surfaces while the rocket motor fires. 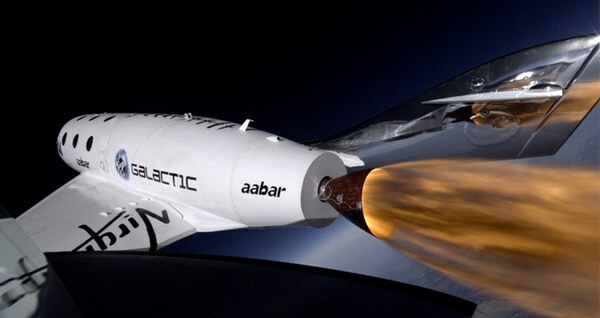 The flight was also the first time that Virgin Galactic’s chief test pilot, David Mackay, was at the controls of SpaceShipTwo, with Scales Composites test pilot Mark Stucky as co-pilot. “With each flight test, we are progressively closer to our target of starting commercial service in 2014,” added Virgin Galactic CEO George Whitesides. That goal will, presumably, require a more active pace of test flights in the months to come. There’s been talk on Parabolic Arc of them experimnting with nylon fuel grain instead of rubber in an attempt to get above 100km, and they confirmed some time ago that once LauncherOne’s liquid engine is ready it would be subbed in. I think they have gone as far as they can go with the version of the hybrid engine they have used for SpaceShipTwo’s powered flights. There are problems with oscillations that they haven’t licked. They are looking at a couple of options to address that problem, the nylon hybrid being one of them. It is possible they will find a solution this year that will allow them to fly to space. Perhaps not the Karman line, but the USAF standard of 50 miles. It doesn’t look as if the LauncherOne engine would be used for SpaceShipTwo, but Virgin would like to replace the hybrid eventually with a liquid bi-prop. A reliable, reusable engine would make the ship a lot less expensive to operate. Branson’s timeline for it may be optimistic, but what else is new?